Dibbling holes for planting leeks. This month is a big harvest time for alliums, and it’s also leek planting time in Virginia. We do this job in early June. I have written about leek planting in 2015 and in 2014 (from flats), and from a nursery seedbed in 2013 . Initially we liked the nursery seedbed method of growing transplants because it freed up space in our greenhouse and coldframes for the crops that really needed protection from the cold, which leeks really don’t. But leek seedlings are skinny, and easily lost to weeds, which we had a lot of in some beds. While planning to really clean up our act with the weed seed-banks in the beds (and plan to use only the cleanest bed for our leek nursery), we tried sowing in flats, and that’s the method we now use. We put the flats directly in the coldframes – we still save the greenhouse space. We found we got better seedling survival in the flats, so we didn’t need to plant as many as we did with the old method. We were able to cut back to 50% of what we had planted. Also the seedlings grew faster and we have been able to transplant 2-3 weeks earlier than with our outdoor seedbed method, from the same sowing dates. Leek seedlings in flats in April. We also learned that weeding leeks is really, really important, and that it can be worthwhile to side-dress leeks part-way through their very long growing season. We made the mistake one year of letting weeds get big before we pulled them up (it was a wet year, not conducive to successful hoeing). We got miserable leeks that year, not just from the smothering effect of the weeds, but we now think that the weeds removed a lot of the soil fertility. We decided to plant fewer leeks and focus on taking better care of them! That has paid off. 6/10–6/25 Spring-planted potato onions. By “spring”, I mean Jan-late Feb here. Elephant garlic will also be ready in June, but we stopped growing it when so much winter-killed that we harvested less than we’d planted! Elephant garlic is botanically a leek (A. ampeloprasum var. ampeloprasum). The small Cipollini bulbs (aka cocktail onions, boiling onions, pickling onions) may also mature this month. The larger ones can be used as fresh bunching onions. All may be cured. Some of those store well (Red Marble for instance). Others such as the flat Gold Coin do not at our latitude, as the necks don’t dry tight, so those should be used soon or pickled. Cipollini naturally have more sugar than most onions, which makes them ideal for caramelizing in butter or oil or roasting whole. 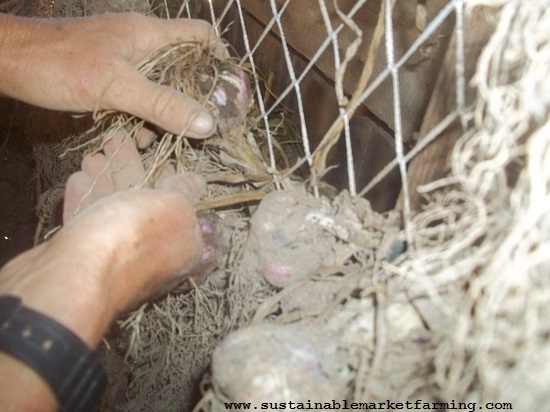 Hanging garlic in netting to cure. As I noted last month, hot weather above 91°F (33°C) ends bulb growth and starts the drying down process. I wrote Garlic Harvest step by Step and Drying and Curing Garlic Step by Step here in 2016, along with some ponderings about whether a ground floor shed or an upstairs barn offers the better airflow, and whether better airflow is worth hauling all the garlic upstairs and down again. We didn’t come to a conclusion, but we didn’t find time to build our new barn. So once again, we are hauling the garlic upstairs to cure and down again after it’s trimmed and sorted next month. Hopefully you will have removed any mulch when you got the scape-appearing signal, and the soil will have had a chance to dry to a workable level. We were doing quite well until we got 3.5″ of rain in one day. Now it’s all much wetter than ideal. Hang your garlic to cure for 3-6 weeks or even longer, with fans if the humidity is high. Don’t set the fans too close to the garlic, your goal is to improve the air flow, not blast the bulbs and shrivel them up. I’ll come back to the question of how to tell when the garlic is cured and what to do then next month. 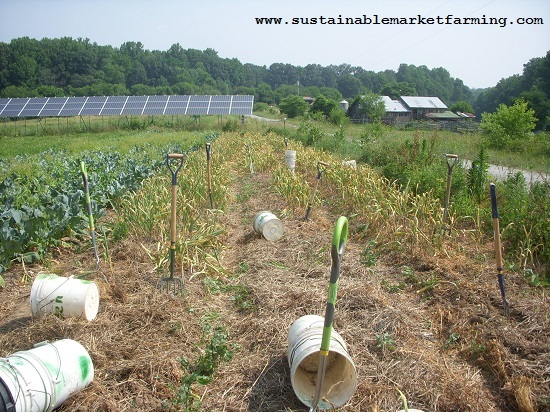 If your garlic is ahead of ours, see my book Sustainable Market Farming, and know that the key is dry necks. Garlic bulb cut horizontally to check maturity (good now or soon). If you live in a cooler climate than us, you might be puzzling over when to harvest your garlic. 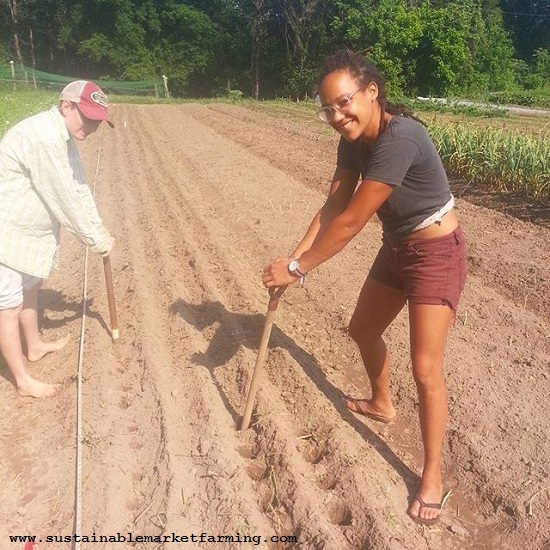 Margaret Roach in the Hudson Valley, New York, has a great article on determining garlic maturity on her blog A Way to Garden. Harvest there happens 7–8 weeks after ours. 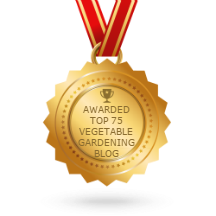 Margaret has a good collection of articles on growing, harvesting and curing garlic. Watch the color of your garlic patch for a general “fading” and also count how many fully green inner leaves there are on a dozen random sample plants. Green leaves represent intact “wrappers” on the bulb, and having at least 4 will help your bulbs store well. Six is better, five is enough, if your garlic doesn’t have to travel to distant markets. If you wait too long, the wrappers will rot in the soil. Another sign of maturity that we use with our hardneck garlic is to dig a few sample bulbs, and cut them in half horizontally. If there are small air spaces open between the remains of the stem and the cloves, the bulbs are ready. If the cloves have not even differentiated, and you are viewing a single mass of garlic, you are too early by quite a bit. Test once a week. If your cloves are already springing apart from each other, you are late. Your delicious garlic will not store for long. You might need to mince and freeze it in ice cube trays, if you want to preserve some for a while. We grow Polish White. Softneck garlics tend to store for longer than hardnecks, so we always save ours till we’ve eaten the hardneck garlic. The big reason we don’t grow only or mostly softneck garlic is that the bulbs have lots of tiny cloves in the center, and these are tedious to peel, when you are cooking for a hundred. According to Ira Wallace at Southern Exposure Seed Exchange, most hardnecks store 4-6 months, although Music and Chesnok Red can keep 7 months or more in central Virginia. Softnecks such as Italian Softneck, Inchelium Red and Silverskins can store for up to 12 months under good conditions. The harvesting process is the same as for fall-planted potato onions. Lift them gently when the tops have died down, and put them to cure on racks with fans. If any of your spring-planted bulbs have produced bulbs larger than 2.5″ (about 6 cm), go ahead and eat those, or refrigerate them till September and replant. Those giants do not store well. Potato onions need sorting about once a month to remove any that are rotting. If it is already a month since you harvested your fall-planted multipliers, do the first sorting now. Timely sorting will minimize waste, because you will stop rot spreading. And you might get to some that are still “good in parts”. Onion bed in late April. There are many different onion varieties and the ones for your area will depend on your latitude. I wrote about this in my book Sustainable Market Farming, and for now, I’ll skip that complex issue. I’ll come back to it in the fall. 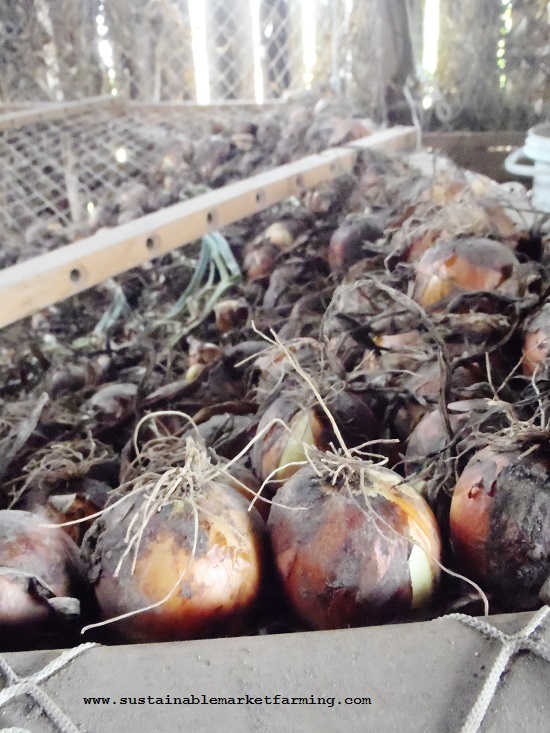 Assuming you have grown some bulb onions, it’s now time to harvest, as they mature. 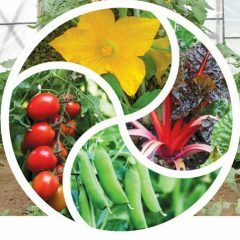 If the varieties you grew are not storing types, simply pull them up when you want to eat them, or when the tops fall over. Most kinds will keep for a few weeks, but some not much longer than that. Be realistic! If you have lots of non-storing ones, you can sell, trade or give them away. Or you can chop and freeze them. Or use them in salsa. 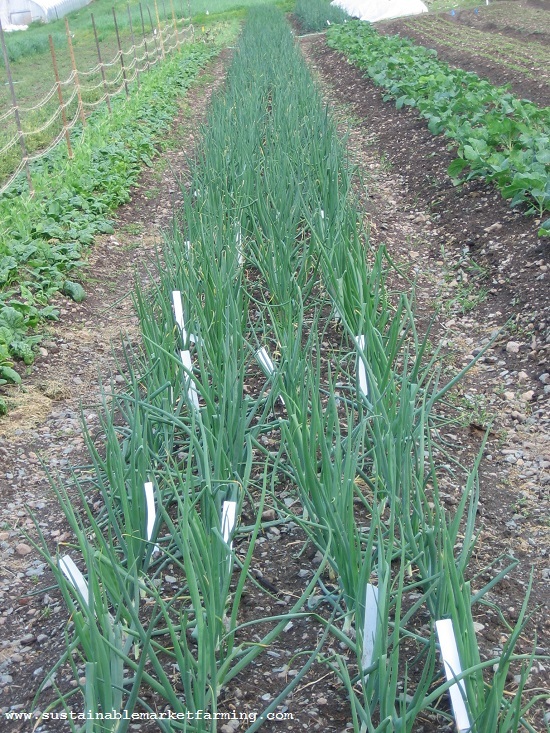 The tops of the onions start flopping over here in mid- to late-June; this is the sign that they are ready to harvest. It’s best to harvest during drier weather, but sometimes you have to harvest wet just to get them out of the ground. 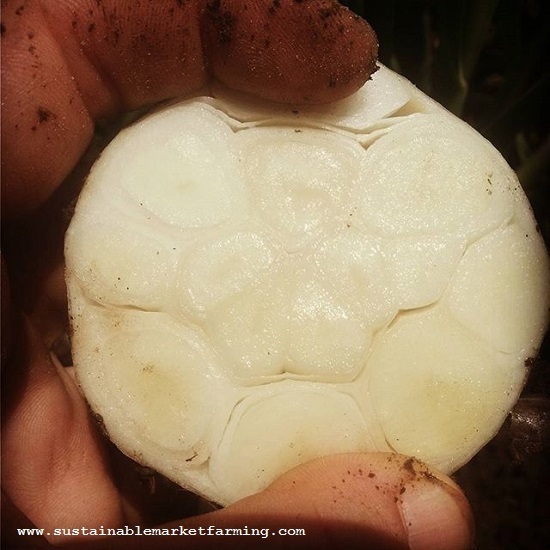 Hot, wet weather is the worst, so it is best not to let the onions sit around in wet soil during very hot days. Start to harvest a variety when about 50% or more of the tops have flopped over. Gently lift the onions out of the soil—harvest only the onions with floppy tops, leaving the upright onions in the ground to harvest another day. Harvest each bed twice—once to get just the floppy ones, and then the second time to get all the rest. Storable varieties should be cured on racks for best airflow, until the necks are dry – about two weeks after hanging the onions. Rub the necks between finger and thumb to determine if they are dry and strawy, or still damp. Trim tops and roots of dry bulbs. No matter what, do not wait more than three weeks after harvest to clear a rack and get the onions in storage. The longer you leave the onions to hang, the more rot you will have to deal with. After three weeks they start to get worse, not better.